"You are what you eat" is a phrase that we have heard for years and years. Although this message may be stale at this point, it does make sense logically. Without nourishment, we could not survive. The types of food we eat and don't eat can play a role in our energy, mood, sleep, and overall well-being. Food is such an essential part of living that, over time, our daily choices can influence health. In fact, poor diet has already been linked to obesity, high blood pressure, heart disease, diabetes, and cancer, to name a few. But, could how you eat be more directly linked to your mortality? A recent study suggests that there may be a connection. The study, titled "Association Between Dietary Factors and Mortality From Heart Disease, Stroke, and Type 2 Diabetes in the United States" and published in the American Journal of Medicine, concluded that in 2012, there were 702,308 cardiometabolic deaths in the United States, including those from heart disease, stroke, and type 2 diabetes. Of those people, almost half of them (45.4 percent) had a suboptimal intake of certain nutrients. Diet seemed to be linked most strongly to mortality in men (48.6 percent), people between the ages of 25-34 (64.2 percent), African Americans (53.1 percent), and Hispanic people (50.0 percent). Each of the dietary factors were assessed based on two 24-hour food recalls, and all dietary intake was adjusted for total calorie consumption to reduce measurement error. Self-reported demographics including, age, gender, race, ethnicity, and education were taken into consideration. While we can't be certain that excess or inadequate intake of certain dietary factors caused the deaths, we do know that there is a correlation between healthy eating and healthy living. Because our diet is something that is within our control, it makes sense to eat more of the good stuff and less of the not-so-good stuff. Eating more unsalted nuts and seeds, fruits, vegetables, whole grains, and omega 3 fatty acid rich seafood (ex: tuna and salmon) is something we should aim for. And limiting processed meats, red meat, sugar-sweetened beverages and salty foods (processed foods, fast food, fried foods) is important for overall health. We can also conclude that there is no "one diet fits all" and that different dietary factors can affect each individual differently. In this particular study, the effects of the dietary factors varied based on age, gender, ethnicity, etc. 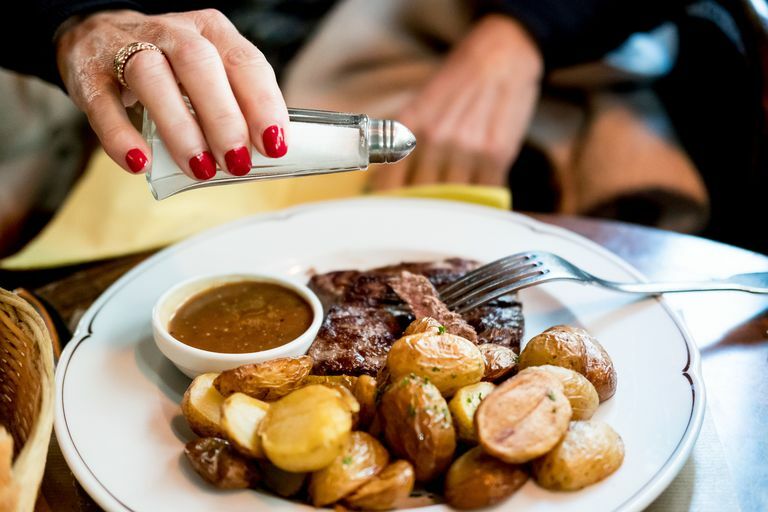 For example, in adults over 65, eating too much much sodium and inadequate amounts of vegetables and nuts had a stronger connection to mortality than the other factors. As with any study, there are some limitations. The study's method of data collection (using observational data) cannot prove that changes in diet, such as an increase in omega 3 fatty acids or a reduced intake of sodium, can reduce disease risk or mortality. In addition, there are some criteria that may have skewed the results. For example, we don't know if the people who consumed high amounts of sodium had other non-healthy habits such as smoking and inactivity. These confounding factors could have affected the results. With all that taken into consideration, the results do show that there is a correlation or an association that is worth some scrutiny. The study concluded that we are seeing an improvement in dietary intake of certain nutrients. Researchers discovered that since 2002, there was a 26.5 percent drop in deaths from heart disease, stroke, and type 2 diabetes. They found an improvement in many of the dietary factors, the most significant of which was an increased intake in heart-healthy polyunsaturated fat (such as walnuts and flaxseed oil), as well as an increase in nuts and seeds and a reduction in sugar-sweetened beverages. Cook at home whenever possible—ordering takeout and going out for meals can increase your sodium intake significantly. When cooking, season lightly with salt to bring out the food's natural flavor. If you can taste the salt in a food, it is too salty. Use herbs and spices, like cumin, thyme, turmeric, paprika, basil, oregano, chili powder, parsley, etc. to flavor food. Do not add salt to food after it has been prepared. Limit intake of fast food, processed foods, and fried foods (frozen food, snack foods like crackers, boxed food, cold cuts). Read labels—if a food contains more than 15 to 20 percent of the daily value for sodium, note that it is a high sodium food and should be eaten in moderation. Snack on whole foods like unsalted nuts and seeds, fresh fruit and vegetables, and unsalted whole grain air-popped popcorn. Micha, R, Peñalvo, J, Cudhea, F; et al. Association between dietary factors and mortality from heart disease, stroke, and type 2 diabetes in the United States. JAMA. 2017;317(9):912-924. doi:10.1001/jama.2017.0947. Should You Try the Consistent Carbohydrate Diet for Type 2 Diabetes?